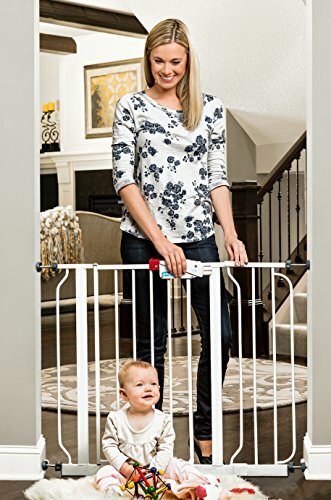 Are you looking for a reliable baby gate? Then you may want to check out the Regalo Easy Step Walk Thru Gate! The Regalo Easy Step Walk Thru Gate can easily be set up with pressure mounts. Hardware to mount to the wall is included as well. This product has a sturdy, all metal frame. It expands to fit openings between 29”-39” wide, and it stands 30” tall. This walk through gate is very easy to open, as it features a one-touch release safety lock. This baby gate also works well for pets. Along with the gate comes one instruction manual, one 6-inch extension kit, four pressure mounting spindle rods, and four wall cups for added security. This is JPMA certified. It also meets the safety standards set by the ASTM. As of this writing there were 7,978 customer comments and 483 answered questions for the Regalo Easy Step Walk Thru Gate. I've read through the customer feedback, and then condensed the results into this review. I hope that this helps you when shopping for a baby gate. "For the reviewers who claim this gate is cheap or defective, you are wrong. Take a moment and read the instructions. Out of the box it appear to be 'warped' as others have referred it it - but it is actually designed that way on purpose...so that you can tighten it and create the proper amount of tension." This is a pressure gate but it has the capability to be securely and permanently mounted using the mounting cups. Some people suggested to be extra safe, it's a good idea to use the mounting cups. If you are putting this baby gate at a dangerous spot like at the top of some stairs, it would be wise to use the mounting cups. "If you mount the cups to the jamb with their small (1" long number 6 flathead screws), the gate's four friction pads are held securely to the jamb and greatly increase the security of the gate. Using the cups, no reasonable amount of pushing can cause the gate to pop out of the jamb. You will have four small holes in your door jamb, however, should you remove the gate in the future. The instructions state that these cups MUST be installed if the gate is at the top of a stairway. You would not want the gate falling down the stairs with a kid behind it." "Installation was actually remarkably easy and it was very well described in the directions - just insert the four pins in the holes at the four corners, hold it in the doorway, and then unscrew the tension cap thingies until the rubber feet are firm against the door. A couple reviews said it would be better with two people but I did it by myself in 2-3 minutes." "For the quality of the gate and for the value/price point, it is a serious winner and it is absolutely worth getting." The Regalo Easy Step Walk Thru Gate is a pressure mounted gate that can also be hardware mounted if you use the mounting cups. If used at the top of stairs or other area that pose danger if the gate fell, it is wise to use the mounting cups. This gate is very easy to install and should only take a few minutes of your time. There is a door gap in the gate that some people think is a defect, but it is not and was designed that way for proper fit. I hope that my review of the Regalo Easy Step Walk Thru Gate helps you decide if you should buy this baby gate!